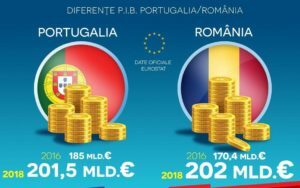 Romania’s economy exceeded, at current prices in euros, Portugal’s economy in 2018, a country with a population and a surface two times smaller as Romania. As a result of Romania’s economic growth of 4.1% last year, GDP rose to EUR 202 billion, while Portugal’s GDP advanced by 2.1% to EUR 201.5 billion, according to data published by Eurostat. On the other hand, GDP per capita in Portugal, an indicator used for measuring the productivity of an economy, continues to be well above Romania. In 2017, it was EUR 22,742, compared to EUR 18,355 in Romania (at the purchasing power parity), according to the latest Eurostat data. If we consider the economic growth of the two states in 2018, this indicator would be about EUR 23,219 for Portugal, still higher than Romania’s level, of about EUR 19,107. The calculation is not accurate, as the methodology used by Eurostat to determine this indicator is more complex. In 2017, after the 7% increase of the local economy, Romania’s GDP exceeded Greece‘s GDP (EUR 187.5 billion in Romania compared to EUR 180.2 billion in Greece). However, the Romanian economy proved to be less productive than the Greek one. Local GDP per capita was 18,355 in 2017, while Greece’s GDP per capita amounted to EUR 20,420.